"The property is 10 k's from one end to the other..." I'm betting if I was plonked the whole 10 k's away I could still see the beaming face of my little man bumping along on the quad bike surrounded by his version of heaven - a real life farm. No little plastic lookalike pigs or cows here - these are the real jumping, slobbering, doe-eyed, big daddy bull beauties. He is shining like the moon. My boys, who normally scream all sooky la la if a dog comes within cooee of them, are sitting comfortably on the bike with their arm resting over Beau the working dog. He's just been for a bit of a run - what seemed like the most part of that 10 k's - nudging and sweeping sheep along in waves through gates, abreast of dips in the land and to a new destination to wait for their lambs to slip into the world. Mr Cool School Dude doesn't usually like to get his hands dirty but today he's into collecting the bones of dead sheep and cattle. He paces over boulders like he's got mountain goat in him, clambers through long grass which says snakes to me, but adventure to him. One skull is the size of my torso. "That one smells a bit, I think it's still a bit green.." He's not worried, a bit of blood and body never hurt him, not today. Bulldozer rides, a real life tractor with a hay fork, feeding baby lambs, shearing sheep and riding sheep! Blue sky, sausage sizzle on a hill with a view which lulls me toward heaven too, children laughing all day long, asking questions, playing and more questions again. The things we have learned about farming life on our visit to this beautiful place, with it's matching beautiful people who host us: No book could explain it to us, no plastic toy would test our children's bravery and ignite their excitement, their passion. No photo could seep into our hearts like the real thing has done. 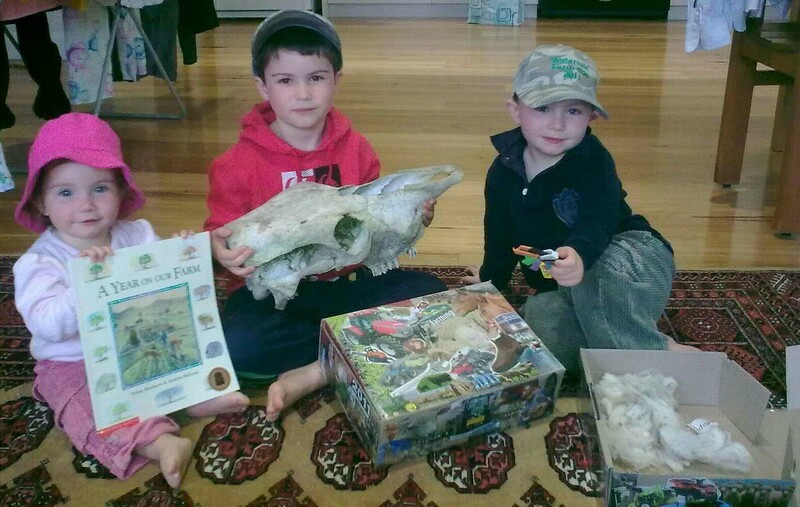 Gifts from our farm day hosts, and a wee memento skull. Beautifully written....you make it sound like a place we should like to visit! Thank you for putting into such eloquent words what FarmDay simply calls "fun, friendship and understanding". Can't wait to help others embark on their FarmDay discovery for 2012!! And we can't wait for it all to happen again! We're spreading the word wherever we can!